Pyrotect Snell SA2015 Certified ProSport Top Forced Air composite helmets have been designed for increased safety, comfort and unmatched quality at an affordable price. The Pyrotect ProSport Top Forced Air auto racing helmets come with a unique six pad interior system which allows for resizing the helmet for a perfect fit and are vacuumed bags and autoclave cured for superior helmet strength and durability while keeping the helmet as light as possible. The clean aerodynamic design, along with our P1 venting system, provides superior air circulation throughout the helmet interior. 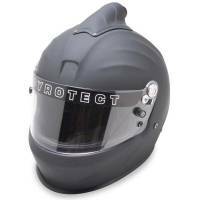 Pyrotect ProSport Snell SA2015 Rated Auto Racing Helmets helmets have been designed for increased safety, comfort and unmatched quality at an affordable price. The Pyrotect ProSport Snell SA2015 Certified helmets come with a unique six pad interior system which allows for resizing the helmet for a perfect fit and are vacuumed bags and autoclave cured for superior helmet strength and durability while keeping the helmet as light as possible. The clean aerodynamic design, along with our P1 venting system, provides superior air circulation throughout the helmet interior. Pit Stop USA offers Pyrotect Pro Sport Full Face Top Forced Air Snell SA2015 Approved Auto Racing Helmets 8000995, 8001005, 8002005, 8004005, 8005005, 8006005, 8020095, 8021005, 8022005, 8024005, 8025005, 8026005 at low everyday prices. Be sure to check out all of our products from Pyrotect including Pyrotect Snell SA 2015 Rated Full Face Top Forced Air Auto Racing Helmets.